Extremely motivational olympic speaker, Adam Peaty MBE is a British competitive swimmer who specialises in the breaststroke. He has represented Great Britain at the Olympic Games, FINA World Championships, and European Championships, and England in the Commonwealth Games. He won the gold medal in the 100m breaststroke at the 2016 Olympics, the first by a male British Swimmer in 24 years. He is the current holder of the world record in 50 and 100m breaststroke. Peaty is the 2016 Olympic champion, the 2015 and 2017 World champion, the 2014 and 2016 European champion, and 2014 Commonwealth champion in 100 metre breaststroke, the 2015 and 2017 World champion, the 2014and 2016 European champion in 50 metre breaststroke, part of the Great Britain team that won the mixed medley relay world title, and the world record holder as of 5 August 2015 in all three events. He is the first swimmer ever to win both sprint breaststroke events at the same World championships, and the most successful British swimmer in a single World Championships. He is one of only three British swimmers, with David Wilkie and Rebecca Adlington, to have won gold medals at all four major international events (Olympic, World, European and Commonwealth Games), and the only swimmer to win all four major gold medals in the same single event at the same time, a feat he completed in winning the 100 metres breaststroke at the 2016 Summer Olympics. Peaty trained at the City of Derby swimming club, where he was coached by Melanie Marshall. He also trained up to eight times per week at Repton School, a co-educational boarding independent school in the village of Reptonin Derbyshire, and two sessions at Loughborough University. He has started to train full time at Loughborough University in 2017.Peaty’s first senior event was the European Short Course Championships, held in Herning, Denmark, where he achieved three personal bests in three events. 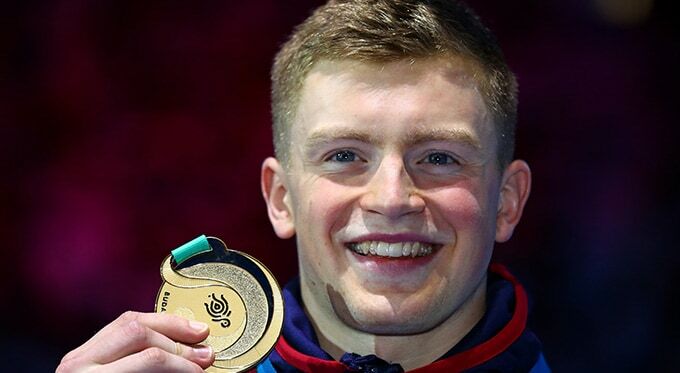 To book Adam Peaty MBE to make a personal appearance at your next event, conference or school, simply contact Champions Olympic Speakers via our online contact form. Alternatively, call a booking agent directly on +44 1509 85 29 27 for any further information.